Time for some inspiration around these parts - today it's all about the garden shed! Do you have one? Let's dive into some reasons why they're so useful to have, and some easy and creative ways for keeping them sorted and organised. - the gardening tools are hard to access (situated behind my husband's work bench), which we use as an excuse to neglect our garden! Can you relate to any of these problems? My husband and I are itching to do many house-projects over the next few years, but we both agreed that the priority was to sort out the garage mayhem first. 1 | This small space takes advantage of the back of the doors to hang gardening tools. Simple shelving inside means that everything is out on display so it can be quickly grabbed and easily put back in place. 2 | I love anything that Jen from IHeartOrganizing does, and the colourful pegboard in her garden shed is no exception. The smaller gardening tools, as well as seeds and supplies, are right at hand, while larger tools are held in place by simple hooks and twine. 3 | Here's another example of a pegboard wall - it really is a great organisational choice in a garage or shed. Cupboards allow more unsightly items to be hidden away. 5 | Some cute and colourful storage options in this shed, with the yellow, red and pink buckets. These containers make carrying supplies around the garden a lot easier, as well as keeping the essentials corralled. 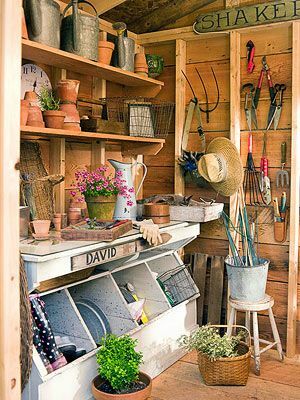 6 | This shed incorporates clever storage with wooden floating shelves above the potting bench, and open slanted boxes below, allowing long/tall items to be easily organised. 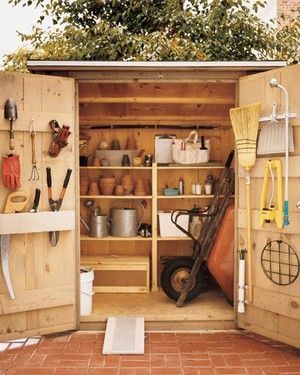 7 | This space looks more realistic to me in terms of all the things that need to be stored in a shed! Open metal shelving can be adjusted depending on the height of items, and there is even enough space for the wheelbarrow to be leaned up against the wall. 8 | This is another view of the same shed, showing how the whole space is being used. The doors hold taller tools, while heavy hooks are used for larger items like extension cords and a leaf-blower. If you're an avid green thumb, you may need a calendar to keep track of when to plant/feed/weed - a magnetic whiteboard on the back wall is good option. 9 | This tiny space has been so well organised - every inch of space is being used! The mesh baskets on the door provide extra storage space; tools are hung on the back wall,; and there is still room on the shed floor for those gardening essentials. If you've got a garden shed, or are thinking of getting one, I hope you've gained some ideas from this round-up. I'll be back on Thursday with a post on how we constructed our garden shed, and a video of the shed organisation on The Organised You TV. Stay tuned!